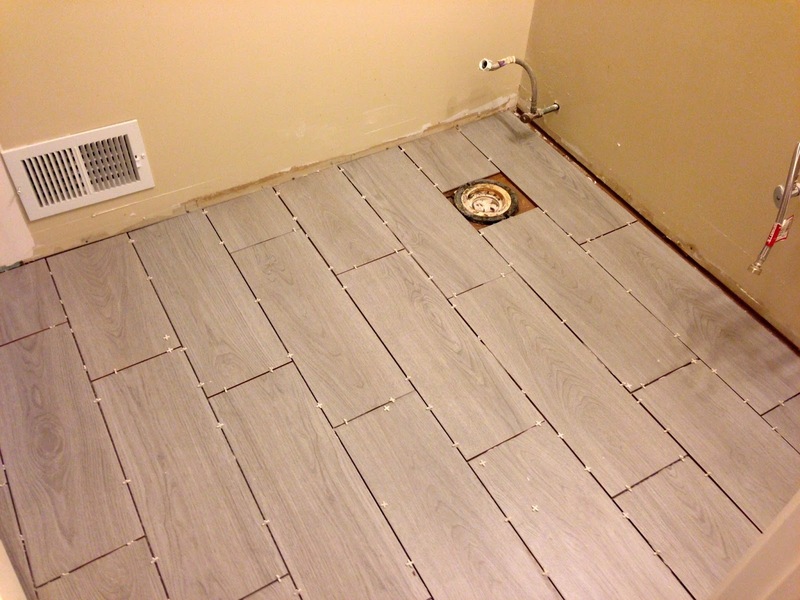 It finally feels like the last major project of our bathroom remodel has been completed, the tile has grout. Ok, so it's not officially completed, there is still come clean up left to do, and the grout still has to be sealed, but close enough, right? 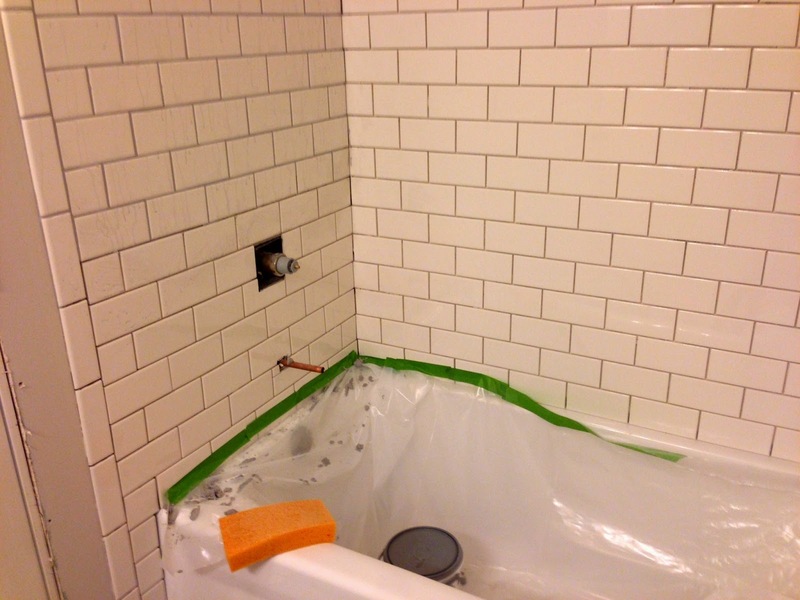 It's amazing how grout can take the project from feeling partially done to almost done, which is super exciting! There is a little after preview. You can see there is still some haze on the floor, I got excited and snapped these photos right after I finished the floor. 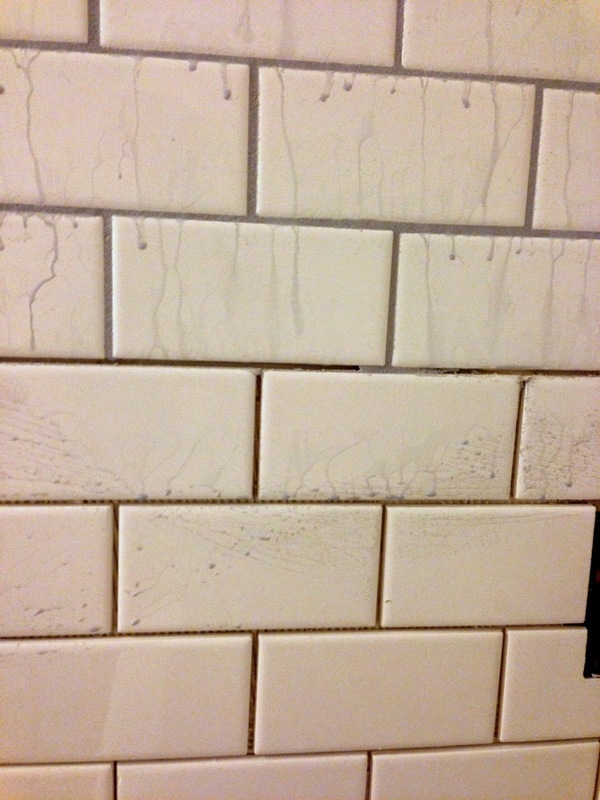 And if you look closely their are some areas on the subway tiles that still need a little more clean up. But before we dwell on that too long, let's rewind and I will show you how we got here. 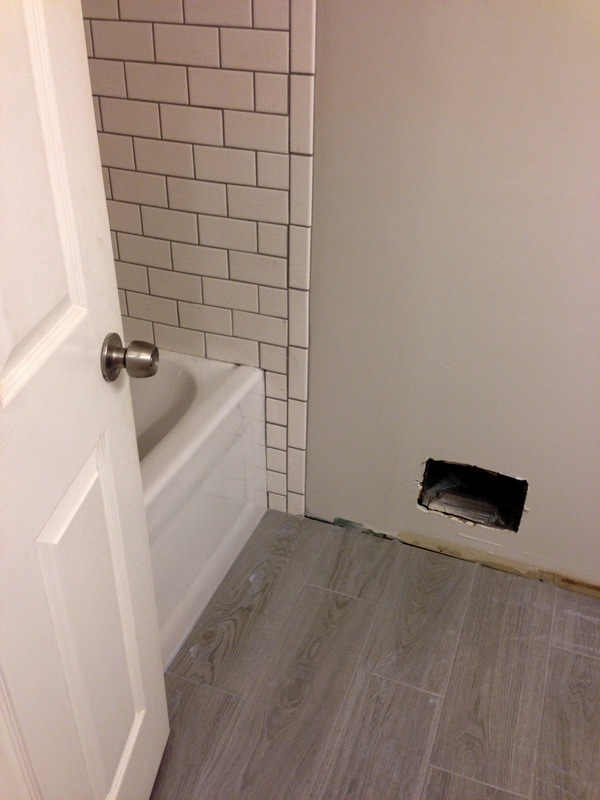 We decided to use the same color grout throughout the entire bathroom, I thought it would make the whole process easier, and using a gray grout with the subway tiles would ensure they would look better for longer. 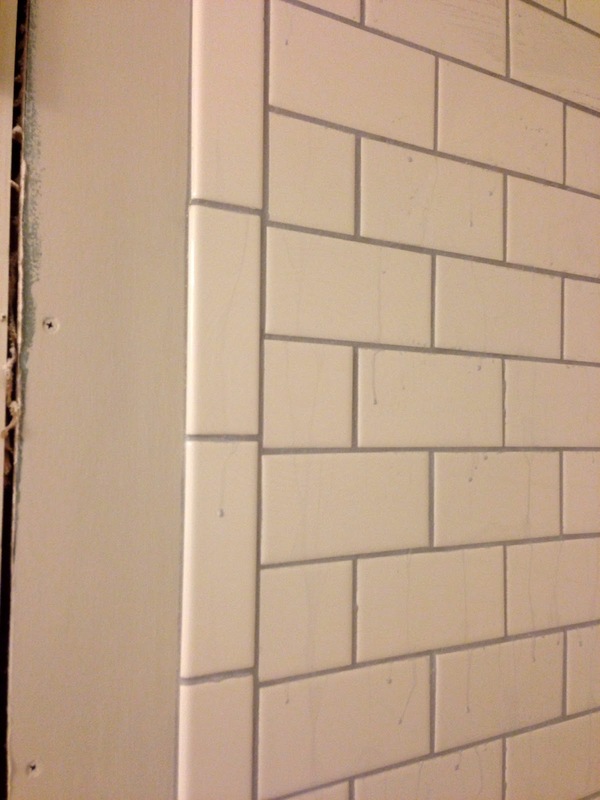 I've heard that white grout is not good for wear and tear, and well our previous bathroom proved that to be the case. Originally that grout was white, it just looks gross. So glad that is now gone! 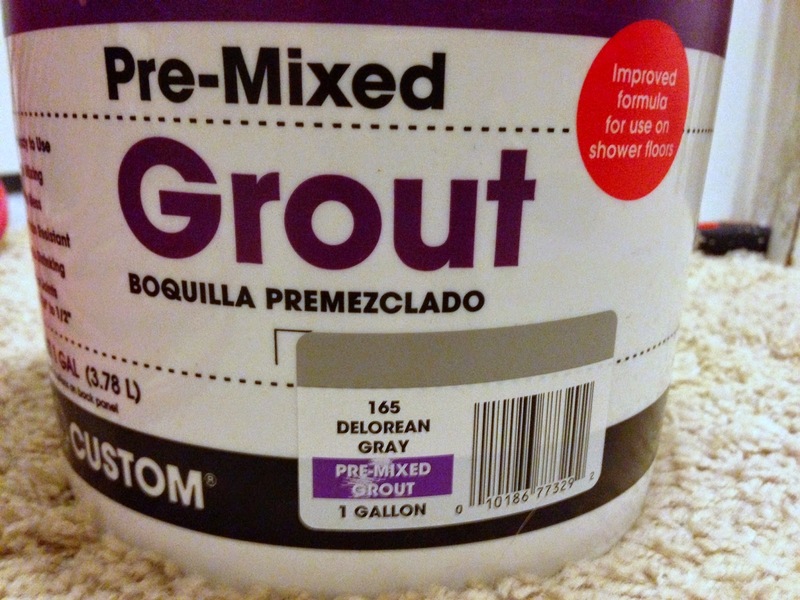 We decided to go with a premixed grout from Home Depot in Delorean Gray. I went the premixed rout more for convenience then anything else. We didn't need a ton of it, it's just plain messy to mix up, and it relies on you getting it the right consistency. The nice thing about grouting is it really is pretty easy. The how to that is, but there are other challenges that can come your way - you will see in a minute. It really is just a process of smearing it on and wiping it off with your grout float, and then making sure you stick to small sections so you can go back and wipe it down with a sponge to clean it up and take off any excess before it has set too much. Now I have done vertical spaces before, our first bathroom, as well as our subway tile kitchen back splash and for some reason I have no memory of having so much grout fall as you were applying it. I mean it only makes sense that some would fall as you are wiping it across since you are working on a vertical surface, but seriously it felt like it was raining grout. I tried to get smart and after completing the first section in the tub I taped up a plastic drop cloth to catch the falling pieces so I wouldn't have to clean them all out of the tub. There were still some casualties once we got down the the very bottom near the tub that will have to be cleaned up, but it is way better than having to clean up everything that fell in the process of putting up the grout. Side note: for any of you that think grouting while barefoot is a good idea, let me tell you that it is not. I had it everywhere, including all over my toes and the only way it was coming off those toes was by taking my polish off, lesson learned. Don't mind the messy tiles, but you can see in the picture the newly grouted area on top in comparison to the tiles with no grout below. It makes such a huge difference, and I'm so glad we decided to use the gray in the shower area. Now I did mention earlier that grouting was relatively easy, but it can also be time consuming depending on the size of tile you have. 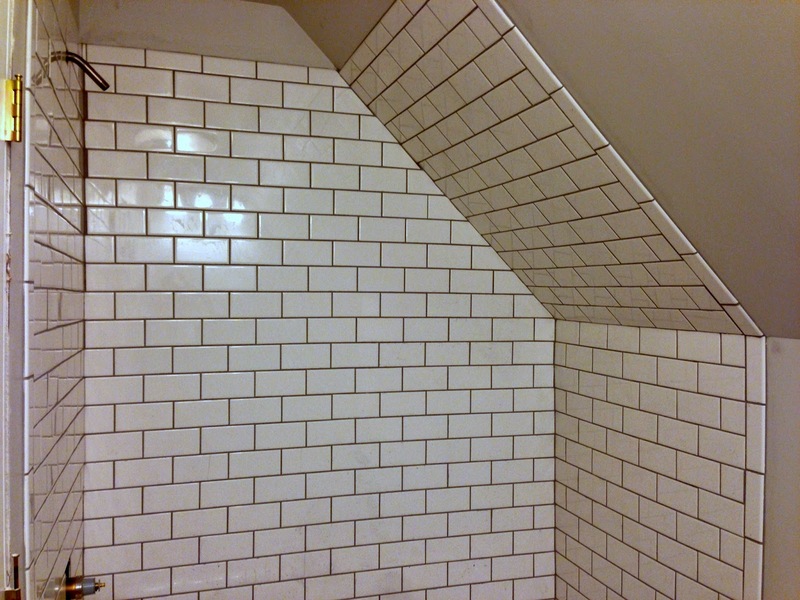 It definitely took us way longer than anticipated to finish grouting all of the small subway tiles in the shower area. I thought we would whip out the entire bathroom in an afternoon, that was my first mistake right there. I know by now that it is always going to take longer than you anticipate. I probably started on the grout around 1pm on Sunday and worked for about 2 hours still we took a break for some food. Then after lunch Martin started in on the grout while I got started on another project, then I joined him about 30 min later and we tag teamed it finishing around 7 pm. The floor didn't even get touched on Sunday! But I couldn't complain, because the results were great. You can see on the top left there are some extra thick grout lines due to the slightly uneven nature of our walls. I tried to fit some slivers of tiles in there, but it just didn't seam right. It's actually way more noticeable in the photos then it is in person. 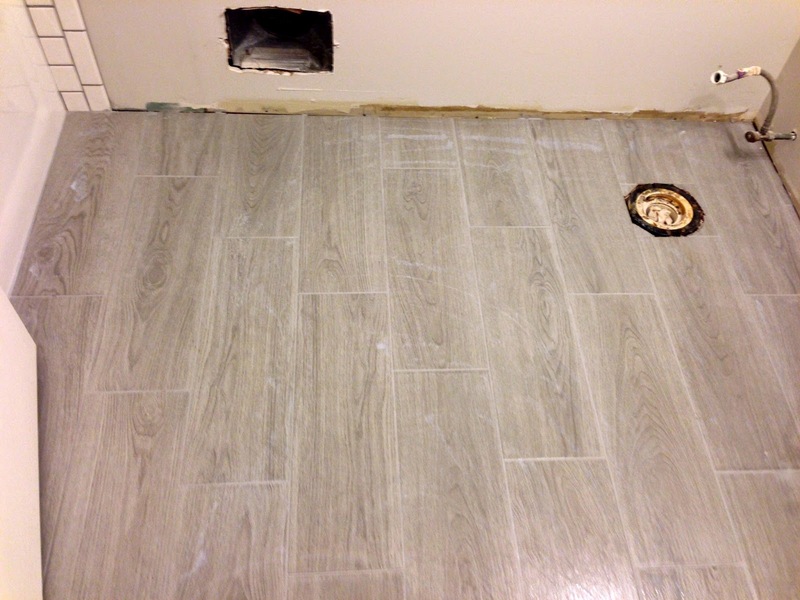 On Monday I was able to whip out the floor in under an hour by myself thanks to the large tiles we used, and small space of the bathroom, there weren't many grout lines to do. Here is the before. This week the haze will be coming off getting the tiles ready for sealing next weekend.. Though there are still lots of little projects left, it finally feels like the end is in sight! You're almost done! It really does look great! The bathroom is looking great, you're almost there! Love that you did this yourself! Looks great! I've never done it but have heard I can learn how to. Grout always sounds and look like a terrible process on the DIY shows! Yours looks great! 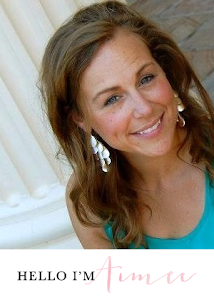 Thanks Kelli, it really isn't that hard to learn to do, you could easily learn how! I know, the end is finally in sight!